I was loaned this copy of Robert Teachout’s book. It is difficult to find and usually expensive. 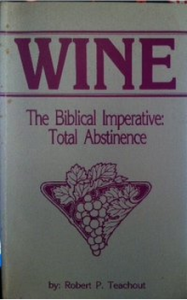 This is the (1983) book version of his Th.D thesis at Dallas Seminary, “The Use of ‘Wine’ in the Old Testament.” He was among the more recent conservatives to challenge the “moderation” view of wine in the Bible. His conclusion that the word “wine” is used of both fermented and unfermented grape juice in the Bible and also in ancient literature encouraged Christians to again consider abstinence from alcoholic beverages. His study of dictionary uses of “wine” over the past two to three hundred years helps us see how our assumption about wine has totally overshadowed our thinking about wine.